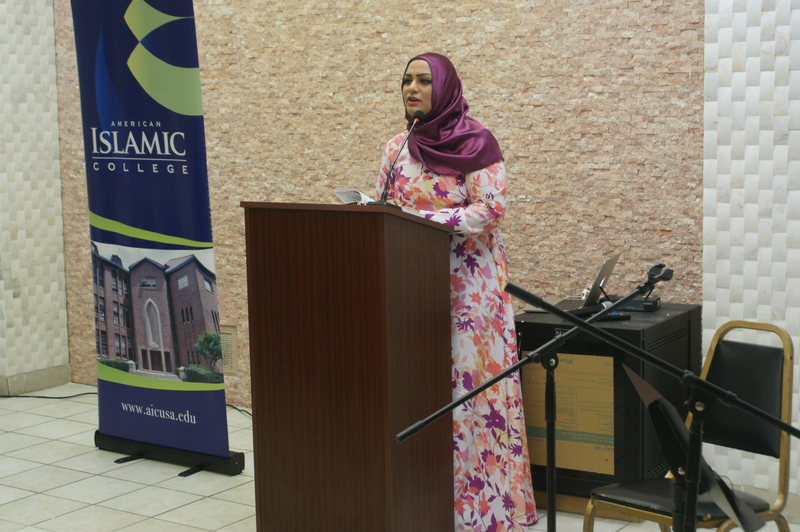 On Thursday, June 16th, American Islamic College held its 6th Annual Ramadan Reception. AIC welcomed Hon. Susana Mendoza, City Clerk of Chicago, representatives from Consulates of Pakistan, Indonesia, and France, President Fr. Mark Francis, Catholic Theological Union, Rev. Michael Shelley, Lutheran School of Theology, Rabbi Michael Balinsky, Chicago Board of Rabbis, Omer Mozaffer, Chaplain at Loyola U, Tahera Ahmad, Chaplain at Northwestern U, Turath Ensemble, and a number of Chicago academics, community leaders, clergy, and interfaith activists, all of whom we were so grateful to have to share in the traditional breaking of the fast. AIC students, faculty, and staff were also present. The evening began with a beautiful Qur’anic recitation by Turath Ensemble’s Ismail Al-Qadi. Then, AIC President, Dr. Ali Yurtsever welcomed the guests with an encouraging note about good intentions and that with good intentions and God’s help, there should be no room for hopelessness in this time of trial. He also mentioned that the Reception itself was a meaningful and symbolic gathering of people as it portrayed God’s gift of diversity in one room and that it was an inclusive space where people of all backgrounds could come together in the name of peace. 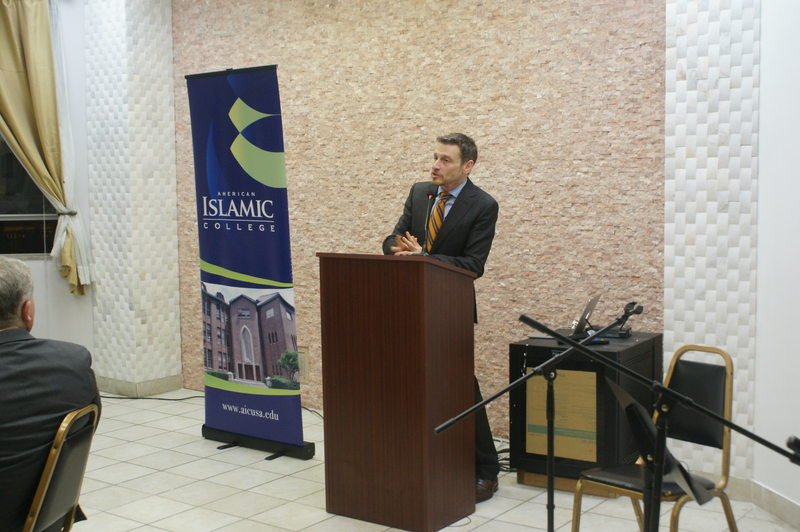 Omer Mozaffar then gave an incredibe Keynote on “Developing a Disposition of Rahma” or Mercy. He inspired attendees to speak up for the oppressed and to lean on each other for support so that together, in being compassionate, we can be transformed and draw nearer to God’s mercy. Turath Ensemble followed with enchanting Middle Eastern music and Islamic Nasheeds. As the sun set, the Call to Prayer, or Adhan was recited, which marked the breaking of the fast. Guests then prayed the evening prayer, Maghrib at the AIC Masjid. All were invited to observe. 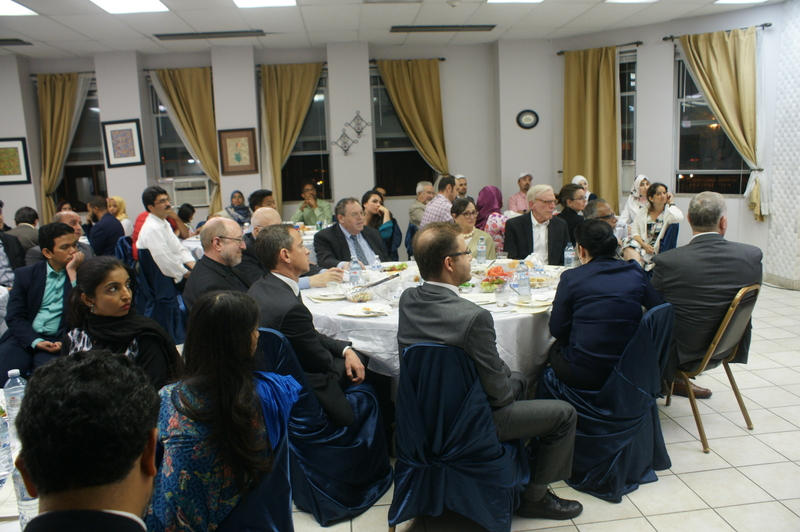 Guests returned to a delicious Turkish cuisine and an opportunity to engage in dialogue. Sr. Tahera Ahmad then offered a dua, or supplication, after the meal. She recited, beautifully, verse 18 of Surah Al’Imran. Reflections from honored guests and students followed. Special thanks go to Hon. Susana Mendoaz, Azam Nizamuddin, Scott Alexander, Mohammed Kaiseruddin, Anya Cordell, Rabbi Michael Balinsky, Oliver Niklin, and Caleb Boclair for their insightful, moving, and heartfelt reflections. Thank you to all who attended. Ramadan Mubarak!